Maryland State Sen. Catherine Pugh (second from left), U.S. Rep. Elijah Cummings (D., Md. ), Baltimore Mayor Stephanie Rawlings-Blake (center) and Rite Aid EVP of operations Bryan Everett (far right) cut the ribbon to officially open the drug chain’s rebuilt Baltimore store. 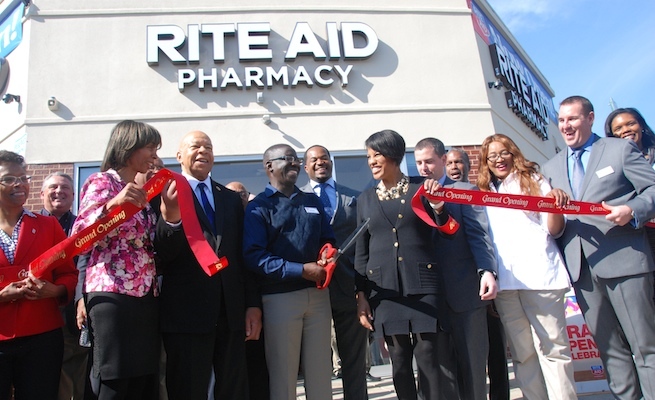 BALTIMORE — Rite Aid Corp. this month celebrated the grand reopening of a store destroyed in the Baltimore riots earlier this year. Executive vice president of operations Bryan Everett was joined by Rep. Elijah Cummings (D., Md. ), Baltimore mayor Stephanie Rawlings-Blake and other city, state and community officials at a ribbon cutting marking the reopening at 300 Martin Luther King Blvd. The store had been operating out of a temporary trailer since May after sustaining significant damage during the unrest. Assistant to President Obama and cabinet secretary Broderick Johnson, Maryland State Sen. Catherine Pugh, Baltimore City Council president Jack Young, councilmen Eric Costello and Nick Mosby, and University of Maryland School of Pharmacy dean Natalie Eddington also participated in the ceremony. In honor of the reopening, the Rite Aid Foundation presented a $10,000 donation to Bettye Adams, principal of The Historic Samuel Coleridge-Taylor Elementary School. The school, located less than a half mile from the store, has nearly 500 students and will use the donation to help fund athletic equipment for physical education classes. The rebuilt store features the Genuine Wellbeing format, which was inspired by Rite Aid’s commitment to providing services, products and resources to help its customers and their families live healthy lives. Upon entering, there is a direct wooden path leading to the pharmacy, the core of Rite Aid’s business. Wellness Stores have pharmacists with special training in diabetes care, medication management and the ability to immunize against about a dozen diseases. A private consultation room adjacent to the pharmacy allows pharmacists to have conversations with patients, administer immunizations and offer other clinical services. 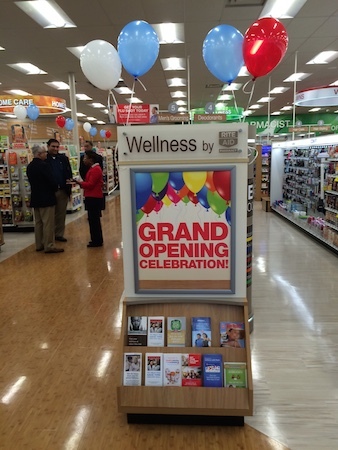 The store’s Wellness Ambassador serves as a bridge between the front end and pharmacy. Wellness Ambassadors work closely with pharmacists to provide customers with access to information on over-the-counter medications, vitamins and supplements, and Rite Aid programs and services. Other key design features include overhead departmental rings designating each section of the store, such as beauty, food, home care and seasonal; a relaxing, warm color palette with soothing wood tones and softer lighting; a reconfigured checkout area; multiple drive-through pharmacy lanes; hundreds of new health and wellness products including organic and gluten-free food; an expanded vitamin selection; a freestanding nail bar as part of an expanded cosmetics and beauty section; and an enlarged food department including additional food and beverage ­coolers. Rite Aid operates 30 stores in Baltimore and an additional 70 in the surrounding area.